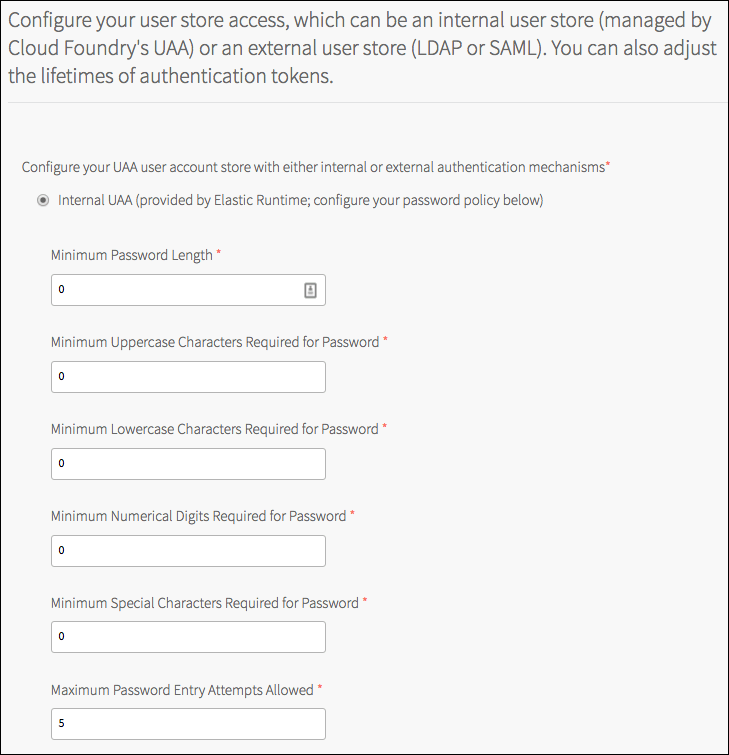 If your Pivotal Cloud Foundry (PCF) deployment uses the internal user store for authentication, you can configure its password policy within the Pivotal Application Service (PAS) tile. Select Authentication and Enterprise SSO on the Settings tab. Confirm that the Internal UAA option is selected. For Minimum Password Length, enter the minimum number of characters for a valid password. For Minimum Uppercase Characters Required for Password, enter the minimum number of uppercase characters required for a valid password. For Minimum Lowercase Characters Required for Password, enter the minimum number of lowercase characters required for a valid password. For Minimum Numerical Digits Required for Password, enter the minimum number of digits required for a valid password. For Minimum Special Characters Required for Password, enter the minimum number of special characters required for a valid password. For Maximum Password Entry Attempts Allowed, enter the maximum number of failures allowed to enter a password within a five-minute timespan before the account is locked.